Zimbabwe’s ruling party, ZANU-PF, on Sunday sacked President Robert Mugabe as its leader. Members also voted Vice President Emmerson Mnangagwa, who Mugabe fired on November 6, as new party leader. In opening remarks at ZANU-PF’s Central Committee meeting, Obert Mpofu, the minister of home affairs, blamed First Lady Grace Mugabe and her allies for taking advantage of Mugabe. “We meet here today with a heavy heart because Mugabe’s wife and her close associates have taken advantage of his frail condition and abused the resources of the country,” Al-Jazeera quoted him as saying. 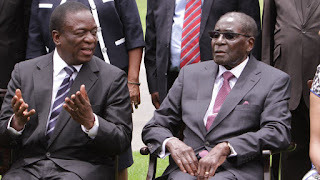 However, the ZANU-PF Youth League, which Grace Mugabe leads, has called for her expulsion from ZANU-PF “forever” and demanded the president to resign as leader of the country and party, “so that he can rest as the elderly statesman he is”. The group also condemned the “unprocedural expulsion” of Mnangagwa.